Freeware, get it from a download mirror. 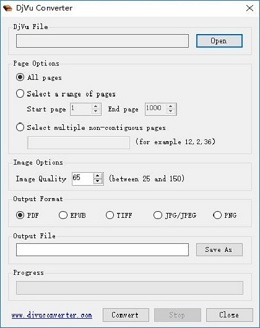 After you select a DjVu file, software will read page count information, and allow you to select pages you want. 2. Image Options, you can set a image quality for output image, by using this factor, you can control image compression rate, default value is 65, the valid values should be between 25 and 150. For PDF format, all images in the specified resolution. For EPUB format, each section title is "page - " + page number, the internal images folder is "images". (1) Output File, if output format is PDF, EPUB or TIFF, you need input an output file name, converted images will be packaged into one file, the generated PDF documents, EPUB e-books or TIFF images will have multiple pages. 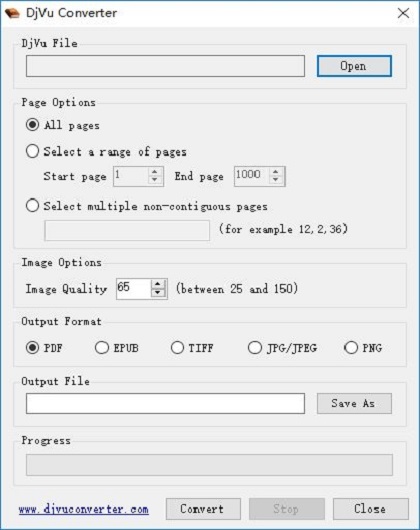 (2) Output Folder, if output format is JPG/JPEG or PNG, you need input a folder, all generated files will be saved in this folder, output file name will be "page - " + page number, each page to a standalone image file. DjVu is a highly efficient image compression technology, it is mainly used to store scanned images and documents. With high resolution and small file size, nowadays, this format has become a very popular e-book format. COPYRIGHT &COPY; 2014 DJVUCONVERTER.COM, ALL RIGHT RESERVED.